It took me by surprise. One minute I was feeling pleasantly excited, anticipating. And the next? Bang. Pow. Whop. Fear like I haven’t felt since I abseiled down a tall building. Or did my first stand up. It’s not unusual to get nervous before standing up to speak in front of others. In fact, I’d go so far as to say it’s necessary to some degree. But I’ll explain and qualify that later. What caught me on the hop was the intensity and the negativity of the emotion. Ok, so I WAS delivering my very first TEDx talk. And there were a hundred people out there. And it was being recorded. And my husband and nephew and a whole crowd of friends there too. So I had expected to feel some colly-wobbles. But nothing on this scale. It might be helpful to share how I normally deal with nerves. First of all, I rarely label them as nerves. It was a tip given to me by a mentor and has served me well over the years. I do notice what physical manifestation of the ‘nerves’ are and acknowledge the science: a good proportion of this feeling is as a result of adrenaline being pumped around my body. Instead of labelling this as ‘bad’, ‘terrible’, ‘awful’ I like to think of this as my ‘Im ready for this ‘ signal. It doesn’t always make the nerves disappear entirely, but it does give me more choices about how I deal with them. Focussing on what I AM going to do instead of focussing on getting rid of them or ignoring them or pretending they’re not there is a powerful and liberating way of thinking. Secondly, reminding myself of what the audience needs to hear from me and spending some time thinking about things from their perspective is also helpful. It means that I am starting to build rapport before I’ve even stood up. Importantly it gets me out of my own head – you know the tiny, insistent inner voice which worries about whether you’ll fall over, forget your words, disappoint people or have your trousers fall down! I also have learned that mentally checking through the beginning opening sentences, the links that take me through each section of the presentation and the ending acts as a reinforcement and gives me the confidence and the reassurance that I do know what I am going to say and the overall direction of the message. After all, I haven’t got the time to do a full mental run through just before I stand up to speak. And noticed as my body gained my control over itself and as my mind calmed and readied itself for the big moment. And it is worth remembering. The time we go on stage and our body and mind aren’t ready is the time we’ll make mistakes or be too cocky or fail to connect with our audiences. What we need to do is get wise to the signals our body gives us and welcome them aboard! That way our performances will be full of energy, focussed and allow us to deliver to our very best. 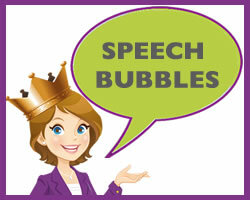 Make sure you sign up to Speech Bubbles - occasional emails with helpful content on how to stand up and speak to groups as well as direct access to my blogs as they are published.